Portable camping grills are ideal for your next camping trip, as they don't take up a lot of space and they are easy to set up. These grills will vary in size, shape, and heating method. The one thing they have in common is that they are easy to transport. The Coleman Road Trip LXE takes the top spot due to its durability and ease of use, including the ability to heat quickly. No matter what type of weather you are in, this grill will be able to heat fast thanks to the PerfectFlow Pressure Control System. Even in the coldest temperatures, you can start grilling within minutes. Along with the removable grease tray, the cast-iron and porcelain surfaces are easy to wipe down. Those who like cosmetic variety will be happy to know that the grill is available in 8 different colors: black, blue, maroon, green, orange, purple, red, and silver. The wheels and handle are located on the bottom of the cooking platform. When you are done using the grill, you simply have to fold the legs and pull the grill by the handle. The grill’s two wheels will help you take the grill anywhere. In the event that something faulty happens to your grill, the Coleman brand offers a 3-year warranty that covers damaged parts. The UCO Flatpack isn’t your average outdoor cooking appliance. This product takes portable grilling to another level; occupying the least amount of space when folded. You can store this grill essentially anywhere. It folds up to about 1.5 inches thick, which is thinner than most laptop computers. When folded, you can fit it in any backpack, suitcase, or car trunk. It also comes with a carrying case, so other stored items won’t irritate the stainless steel finish. 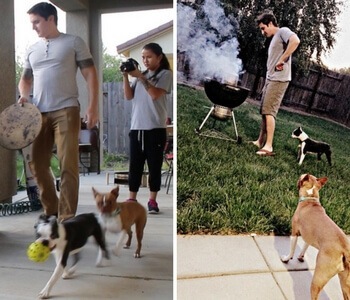 This compact grill comes in two sizes: regular and mini. The regular size measures 13 x 10-inches and can grill up to 6 servings. The mini version has a 9 x 6.75-inch grilling area; allowing up to 3 servings of food at once. Needless to say, the smaller version is better for solo trips or camping with less than a handful of people and the regular version is best for larger groups. Creating a stable platform for this grill is easy. Assembly only takes a minute. Once the grill is set up, the sides act as a wind-breaker, so that airflow won’t put the fire out. The durable stainless steel construction will deter any form of rust or deterioration. 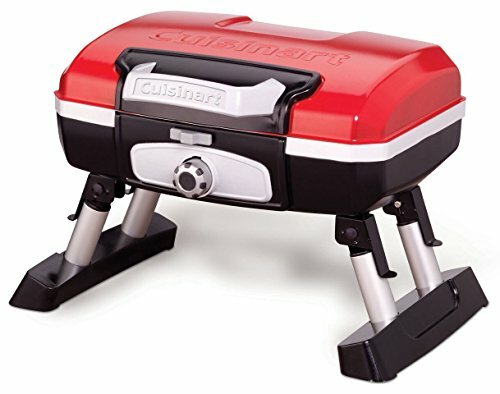 The Cuisinart CGG-180T is a convenient portable grill for any camping trip. The beauty of this grill is that it can essentially be used anywhere, even in smaller areas. It is equipped with a stainless steel burner that will emit 5,5000 BTU’s. Despite the small size, you can cook up to 8 burgers or steaks, up to ten chicken breasts, and approximately 4 pounds of fish. Even if you're cooking a lot of food, with the help of the high powered burner, you can expect your food to be cook rapidly, so you can spend less time next to the grill and more time camping with friends. If you’re tired of the traditional black grill colors, you’ll be happy to know that this grill comes in two other colors – red and silver. With the aluminum folding legs, it is easy to store. Ever thought about building a stove to cook with while camping? This camp stove kit by the Firebox brand is delivering a new outdoor cooking experience for your camping trip. Several metal pieces are fitted together to create the stove. Before assembling, the kit takes up very little space in a backpack or hiking bag. Despite the small size, this is one of the most efficient camping grills on the list. It can boil two cups of water in less than three minutes. It is also equipped with the Cross Feed Fuel Delivery System that is placed on an angle to improve the efficiency of the heat source. The kit comes with Firebox Firesticks that can also be used as food skewers or to hold the Firebox Stove closed. You will be able to find this stove kit at a very reasonable price. Sure, at face value it looks like a stainless steel cage and some accessories, but once you put them all together you will have a fast cooking grill system. 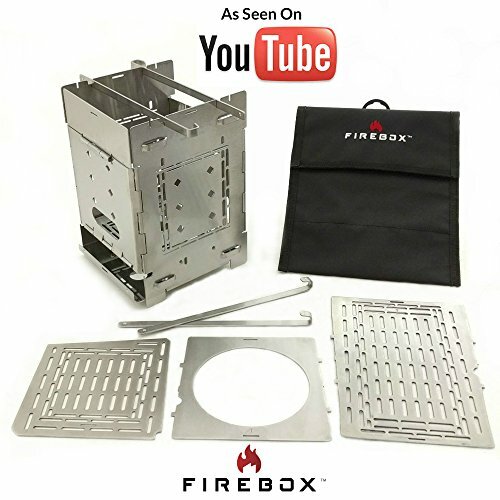 There is also a series of YouTube videos from Firebox that help explain the various ways to use this grilling kit. You can learn different cooking methods and ways to cook your food to perfection. You can expect this cooking kit to last long, as it’s made with a durable stainless steel frame that can be treated with some oil whenever you’re not using it. This is one of the more compact options, which is great if you want to keep your camping gear to a minimum. The Blackstone Dash portable grill is another great option. The sturdy legs will give you the ability to use this grill on a variety of different surfaces without feeling as though the grill is going to fall over. This versatile grill has a 240-square inch cooking surface that offers a grill surface on side and a flat griddle on the other side, all on top of a 7000-BTU burner. The Blackstone brand strategically designed this grill so that you can flip the cooking plate with little to no effort. This will allow you to adapt to cooking different foods without taking a long time switching cooking surfaces. There is also the grease management system, which takes away the fat from the food and makes it very easy to clean once you're done cooking. Most people will be delighted to know that you can typically get this grill for less than $100. This is ideal for those who are on a budget but want a solid grilling option for their camping trip. Despite these great features, this is not the most durable grill. Some users have complaints about the overall quality of this grill. While it works very well in the beginning, some units begin to break down after a short period of time. Though, if you're careful with your grill, this may not be an issue. The portable camping grill you decide to go with depends on how you will use it. If you like to go on backpacking hikes during your camping trip, smaller grills are your best option. Stove grills such as the the UCO Flatpack or the Firebox Bushcraft will meet the needs of a backpacker on the go. These grill units are extremely lightweight and thin, so they can fit in any type of backpack or narrow bag. The Cuisinart CGG-180T is also an option for backpackers, although the bulkier frame will take up a little more space. 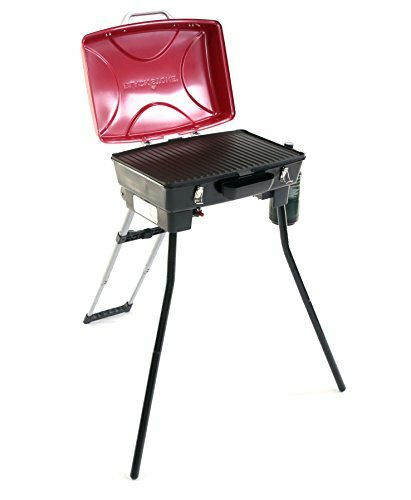 If you don't have to travel a long distance on foot, you could probably use a slightly large portable grill. 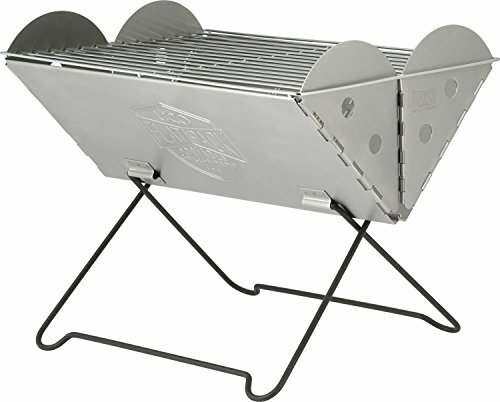 The Blackstone Dash portable grill has long legs that will provide a stable platform for cooking on any type of ground. 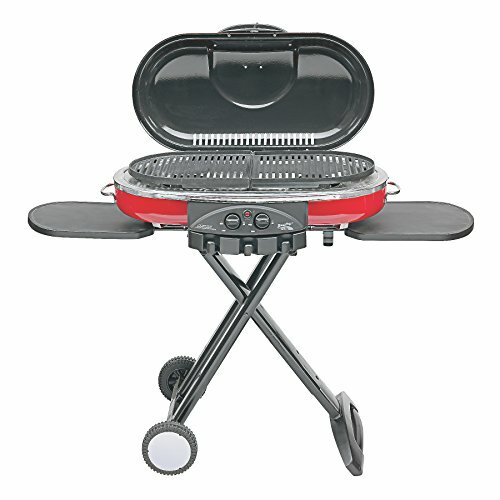 The Coleman Road Trip LXE also has sturdy legs that are much easier to fold compared to the Blackstone grill. The Coleman grill also has wheels, making it easier to move from one place to another. When going on camping trips, people can experience unpredictable weather. That is why it’s imperative to find a grill that will last long regardless of the weather you grill in. Over time, grills can start to rust. Buying portable camping grills that are made with stainless steel will ensure you that you won’t have to deal with a rusty grill. The type of heating fuel you prefer to use will also be a factor before purchasing a portable camping grill. This decision ultimately comes down to personal preference, as some people like charcoal while others prefer propane gas. The Firebox Bushcraft and UCO Flatpack can work with wood and charcoal, whereas the Blackstone Dash, Coleman Road Trip LXE, and Cuisinart CGG-180T strictly utilize propane. They are very light, and great for backpacking. A lot of camping enthusiasts genuinely enjoy the thrill of being out on their own. No internet. No cell phone reception. Just a group of people and the wild. For the creative camper focused on “survival”, the Firebox Camp Stove will help keep your stomach full as you’re roaming the woods. Sure, it might not be the best option if you want a cooking source that heats instantly. It won’t be the best if you have a lot of food to cook at once. But if you have patience, and want to cook your food using different types of materials, this stove will be a great asset to your camping bag. Portable camping grills give you the freedom to roam the outdoors without having to head back to the main campsite every time you get hungry. All type of portable camping grills should be light in weight, so that they are easy to carry wherever you go. Grill stability is also important. Some grills have long folding legs that can help the grill stay still on unstable, grassy grounds. Other grills are meant for a tabletop, such as the Cuisinart CGG-180T, and there are a couple that utilize stainless steel legs that can be used in the sand. Grills with longer legs like the Blackstone Dash and the Road Trip LXE would be great for campsites outside a tent or RV, but not for a hiking trip or the beach. Some grills use charcoal or wood as a fuel source, which could be too much to carry for the average individual with a backpack. If you don't want to forage for wood or carry a bag of charcoal, you should consider a compact grill that utilizes a one pound propane cylinder. In the end, the decision is yours. You should choose a portable grill that matches your needs. Consider how much space you have available and how far you plan on walking. If you intend to park at your campsite, you don't necessarily need a grill that will fit in your backpack. Though, if space is limited, you may want a grill that can fold down or be taken apart to fit inside your pack.